Right now I’m laughing pretty hard. There just seems somthing so appropriate about a Vampire in politics. Maybe it’s all of the “sucking the country dry” jokes I’m currently thinking of. Jonathon “The Impaler” Sharkey wants to move to Washington, D.C., to become the nation’s first vampire president. Well, with that nickname, it ought to make for some interesting foreign policy. Sharkey, 45, spent Friday on a Greyhound bus with his new fiancee, Audrianna Foster, a 19-year-old girl from Ohio he met online. She too believes she is a vampire, or vampyre. Well, he should fit right in, he already has the arm candy wife. 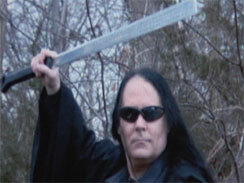 “The Impaler” claims he’s a direct descendent of Vlad II the Impaler, better known as Dracula. And people holler about Obama’s lineage, good luck finding the birth certificate on this one. He has scheduled a Monday press conference in Tampa to announce his plans to file paperwork to run for President of the United States in 2012. He recently switched his party affiliation from Independent to Republican so he can run with the G.O.P. He should fit right in with those bloodsuckers. He ran for Governor of Minnesota in 2006 and also had short-lived bids for U.S. Senate in 2000, U.S. President in 2004, and U.S. President in 2008. Hey maybe third time’s the charm. Anyway, let’s check out Sharkey’s record shall we? He’s accused of “brainwashing a 16-year-old in Minnesota. That should prepare him for politics. The two were engaged until last month. Her family now has a restraining order against Sharkey and claims his texts to her violate it. He reportedly admitted to harrassing another 16-year-old Minnesota girl online in 2009. I think I’m noticing a pattern here. Dude wake up, they’re not old enough to vote. He was arrested in Tennessee several years ago and is currently on probation from Indiana after he was found guilty in 2009 of intimidating a judge. I like that one. He’ll fit right in in Washington. He served six months in a Marion Co. jail before his release. Sources confirm the Secret Service has had to keep him on its radar, since he moves around the country. Well, they might as well get used to it. If he wins they’ll have to protect him…from Vampire Hunters. Is Buffy still 16? It appears this Leprechaun had lost his pot of gold and wanted to replace it with bank notes. A man dressed in green and carrying a large-caliber gun held up a branch of the First State Bank in the Nashville, Tennessee, suburb of Gallatin on St. Patrick’s Day, said police spokesman Sergeant Bill Storment. The costumed man, wearing a green top hat, vest and shorts and a fake brown beard and wig, had previously gone into the Fifth Third Bank next door, according to its manager Sharon Riehemann, when the bank lobby was crowded with lunchtime customers. “He started to come in, then looked at his watch, then turned around and left,” she said. Apparently there wasn’t enough gold in that one. “He then walked toward the other bank, and a couple of minutes later he ran out of the bank with a blue bag in his hands,” Riehemann said. Police said two men were in the car that sped away, and that they fired at police during the chase, disabling one police car. Storment said the two ditched their vehicle and ran into a field near a subdivision. “They were killed while exchanging fire with officers,” he said. Isn’t it bad luck to shoot a Leprechaun. He apparently had run out of lucky charms as well. No officers were injured, and money was recovered from the suspects’ vehicle, he said. The robbers should have stuck with green beer. Here’s a drunkard’s dream if I ever did see one. The appropriately named Crooked House has been labelled Britain’s drunkest inn, and for good reasons. 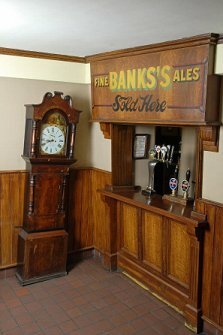 Glasses regularly slide across tables at the Georgian pub and coins appear to roll up, rather than down, the bar. This would be so much fun. The tavern, which was built as a farmhouse in 1785, got its design fault through settling of the ground caused by mining during the 1800s. It means that one end of the Crooked House is 1.2m (4ft) lower than the other. So, if it feels like you’re walking uphill to get a brew, you are. The alehouse in the Staffordshire village of Himley has become a big tourist draw. “I look after 1,800 pubs for Marston’s and this is definitely the one that leans the most,” said Sonny Mann, property surveyor for the brewery. I wonder how much sampling of the local wares he does? “The pub’s quite safe though and hasn’t moved for ages. We use special ‘glass tails’ over cracks on the walls – if the glass breaks then we know it’s moving again.” It’s either that or another drunk has fallen off his stool, rolled downhill and collected in the corner. “Hey bartender, set me up again, would you?” I’m thinking, drinking here would be a perceptual challenge. After a few pints, aiming for the door might be a project.